Spring has sprung, and so have my love and me. Sprung at the chance to take a road trip to go and visit Jared's family for nearly a week that is! I'll try my best to document our stay while we're here in the Sand Hills of NC, so we won't forget it and so you'll also be a part of our (Jared and Sarah's) Spring Break adventures. I got up and finished getting my things together Friday morning and then momma, my sister and I decided to head out for bite to eat (for one last all-girl hoorah!) before Jared and I left for our trip. Jared was supposed to be in his health class at school, when I got a text saying he'd be leaving even earlier to come pick me up because his class was cancelled (do all college professors like to up and cancel on every super-springy-and-nice Friday afternoon or something? Anyway, Jared got to my house around 1:30pm, after us girls had finished eating Philly Cheese Steak Sammies and played chicken with an oncoming train to make it home on time (don't ask!) Then we had a rubiks-cube-shuffle-thon to get all of my stuff mixed in with Jay's stuff in his car, named Beulah. Usually Jay is a light packer, but this trip he decided to bring more stuff that he didn't need up in A-ville, like all of his Winter-wear. It was smart of him to do so, but it was interesting to play a game of close-the-trunk-quick-before-the-trunk-explodes. After a 5+ hour car ride, one stop at a McDonald's for a Mocha Frappe/Mickey D's Sweet Tea and me talking non-stop (because of my chocolate and coffee intake) about everything from music to movies to theology...oh, and evil mermaids...we finally made it to the Fisher's new home, which I hadn't yet seen. By 10pm Dad and Mom Fisher had turned in for the night. Jared crashed in Seth's room playing video games for a bit, and I decided on a hot shower to end the long day nicely. But before Jared and I went to our own rooms to sleep we decided to uphold our latest "tradition", if you will, of reading together before bed. So, Jay and I crept downstairs. 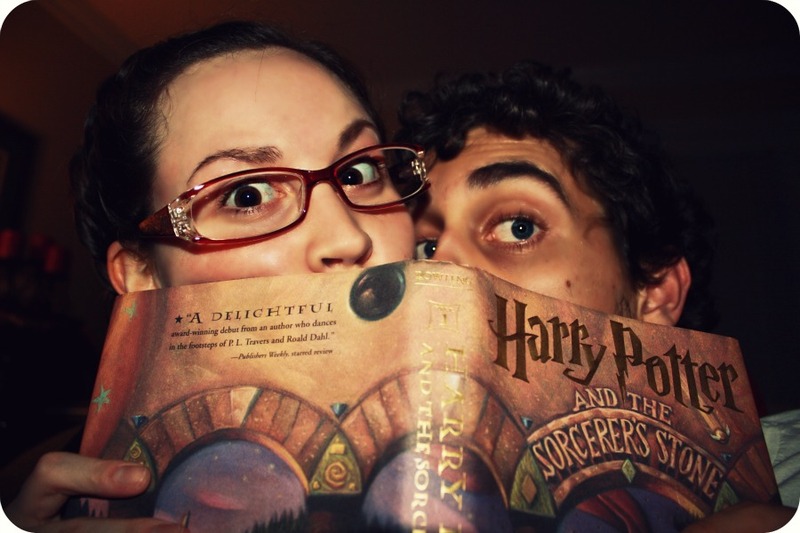 I led the way with book and reading glasses in hand and we settled in on the love seat in the living room to read the penultimate chapter of Harry Potter & The Sorcerer's Stone. After we finished our chapter we headed to our rooms. Jared tucked me in for the night and we prayed together. Then it was supposed to be lights out time, but I ended up snuggling up in bed and reading Replication until I couldn't hold my head, or eyelids up any longer.